Hollywood celebrities feared her. William Randolph Hearst adored her. Between 1915 and 1960, Louella Parsons was America's premier movie gossip columnist and in her heyday commanded a following of more than forty million readers. 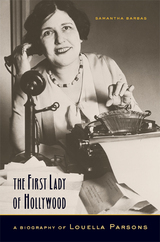 This first full-length biography of Parsons tells the story of her reign over Hollywood during the studio era, her lifelong alliance with her employer, William Randolph Hearst, and her complex and turbulent relationships with such noted stars, directors, and studio executives as Orson Welles, Joan Crawford, Louis B. Mayer, Ronald Reagan, and Frank Sinatra—as well as her rival columnists Hedda Hopper and Walter Winchell. Loved by fans for her "just folks," small-town image, Parsons became notorious within the film industry for her involvement in the suppression of the 1941 film Citizen Kane and her use of blackmail in the service of Hearst's political and personal agendas. As she traces Parsons's life and career, Samantha Barbas situates Parsons's experiences in the broader trajectory of Hollywood history, charting the rise of the star system and the complex interactions of publicity, journalism, and movie-making. Engagingly written and thoroughly researched, The First Lady of Hollywood is both an engrossing chronicle of one of the most powerful women in American journalism and film and a penetrating analysis of celebrity culture and Hollywood power politics. Samantha Barbas has a Ph.D. in American History from the University of California, Berkeley, and is the author of Movie Crazy: Fans, Stars, and the Cult of Celebrity (2001).